Hand-Crafted in small batches. Great wasabi kick that stops just short of head-clearing! 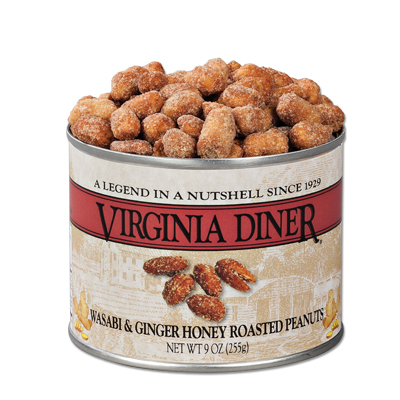 We begin with our Extra-Large Honey Roasted Virginia Peanuts then tumble in a robust mix of wasabi and ginger seasonings. This flavorful, distinctive peanut is not your grocery store variety! A gift for any adventurous foodie. In a vacuum-packed tin for maximum freshness. Love Virginia Peanuts! Great Products, reasonably priced and low cost shipping too. Got these as a gift. And they proceeded to open them immediately. We all agreed that these were definitely odd. Nothing quite popped in the way that we expected the flavors to do. Would certainly purchase other Virginia Peanuts again... but not this one.